The on-again, off-again Southwest deal is back–when you apply for a new Southwest Airlines Rapid Rewards credit card (either the Southwest Airlines Rapid Rewards Plus Card or the Southwest Airlines Rapid Rewards Premier Card), you’ll earn 50,000 bonus points after spending $2,000 in your first 3 months of opening your account. 50,000 points can be redeemed for $714 towards Wanna Get Away fares, which is enough for 2 average round-trip flights. Alternatively, 50,000 points can be redeemed for $500 in gift cards. The annual fee ($69 for the Plus card, $99 for the Premier) is not waived and will be applied to your first billing statement. Also, if you received a new Southwest cardmember bonus within the last 24 months, you are not eligible for this offer. One of the nice thing about these Southwest deals is that it is possible, if you are ambitious and can meet the required spending, to apply for multiple versions of the cards to earn multiple bonuses. Aside from the obvious, why is that potentially an even better deal? Because the points you earn from these bonuses also count towards earning a Companion Pass. When you have Companion Pass status, you can name one designated companion who can fly free with you every time you fly on Southwest, provided they share the exact itinerary as you, as long as a purchaseable fare for your itinerary is still available. You earn Companion Pass status by either flying 100 qualifying one-way flights or earning 110,000 Qualifying Points in one calendar year. Since applying for each credit card effectively nets you 52,000 Qualifying Points (50,000 from the bonus + 2,000 from the required spend), applying and earning the signup bonus for 2 cards gets you nearly all of the way (104,000/110,000) towards Companion Pass qualification. Once you earn Companion Pass status, it’s good for the rest of that calendar year and for the entire calendar year immediately following. So, for instance, if you earned 110,000 points in November 2014, you would have Companion Pass status through the end of 2015. 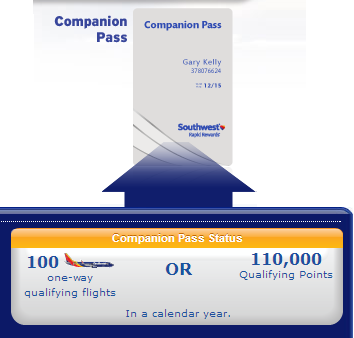 If you earned 110,000 points in January 2015 instead, your Companion Pass status would be good through the end of 2016. If you have a significant other that you travel with frequently, the Companion Pass is a great deal, as you can effectively halve your airfare. More information on the Companion Pass program can be found here. Want to keep up with the latest credit card deals? Disclaimer: This content is not provided or commissioned by the credit card issuer. Opinions expressed here are author's alone, not those of the credit card issuer, and have not been reviewed, approved or otherwise endorsed by the credit card issuer. This site may be compensated through the credit card issuer Affiliate Program. This site has financial relationships with some of the cards mentioned here and may be compensated if consumers choose to apply for these links in the content and ultimately sign up with them. Disclaimer 2: CreditCardWatcher.com strives to give our readers a thoroughly unbiased and independent opinion. While we make reasonable effort to provide fair and accurate information, it is presented without warranty. *See the credit card issuer's web site to review the terms and conditions of all offers. While reasonable effort is made to maintain the accuracy of credit card information, it is presented without warranty.